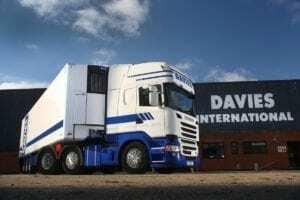 Davies International has updated its fleet with 10 new temperature-controlled trailers with Carrier Transicold Vector 1950 units. The new 13.6-metre trailers be will be used intensively seven days per week, covering up to 150,000 kilometres each year. The units offer increased cooling capacity versus the units they replace meaning faster pull-down speeds and the ability to haul larger loads over longer distances. The trailers use Carrier’s patented E-DriveTM all-electric technology, which transforms engine power into electricity through a generator, reducing risks of leaks and emissions, reducing fuel consumption and lowering carbon emissions. The units are backed by Carrier Transicold’s comprehensive everCOLD full-service which includes repair and maintenance, annual temperature control testing and certification, full regulatory checks, and access to Carrier Transicold’s oneCALL 24/7 incident management service.